easy to develop and flexible. But let’s face it, with our background, and the fact that Ruby is dear to our hearts, the choice was obvious that it had to be Jekyll. Now what is Jekyll exactly? Jekyll is a static site generator written by a co-founder of Github, Tom Preston-Werner. Blog focused generator, super easy to operate, gives us power of Ruby in form of plugin system for creating custom content for our site, and many more. You can read about that on the Jekyll site. Continuous Deployment - hands free project deploying based on github/gitlab/bitbucket activity. SSL - Out of the box HTTPS for default domain, you know what not having that means today, right? Redirects - that one was big for us, as lot’s of old site urls were long and not so SEO friendly, so we had to change them, and redirects are a blessing. Git gateway - GitHub/GitLab accountless access to repo? Aww yiss! So choosing Netlify seemed like a good idea though there still was the case of jekyll-admin, it wasn’t exactly what we needed. Fortunately guys from Netlify also created Netlify CMS and after reading through the documentation, we thought “yeah, this is what we want”, and what exactly was that we wanted? Well, let me tell you. What’s this Editorial Workflow all about actually? 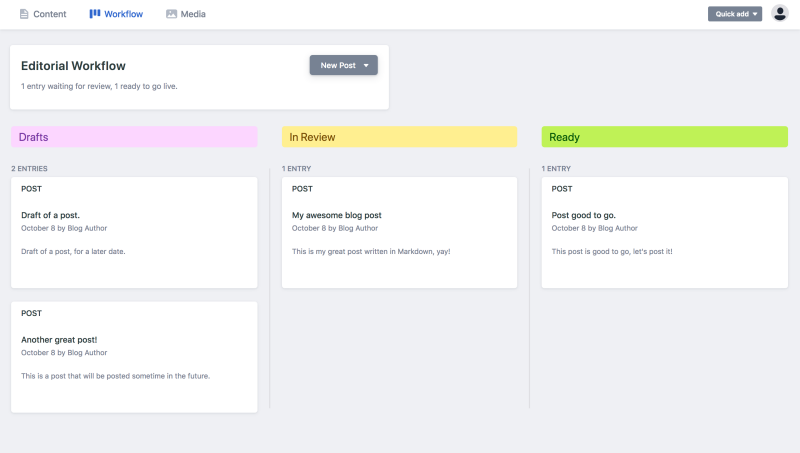 It gives our content creators ability to write content (posts, case studies, testimonials and such), request changes, edit it and then, when it’s ready, publish it. Thanks to the way Netlify CMS implements that, each post, testimonial, etc. can be published without any involvement from a developer, but the cool thing about this is that before going live our changes can be previewed on a separate site which is deployed by Netlify out of the box. In my opinion widgets are the main awesomeness of using Netlify CMS. They give use power to make any page editable through the admin panel, pretty much anything can be edited there. It gives our content creators an ability to set name of url, title and description, add images, change layouts, and anything else you may think about.